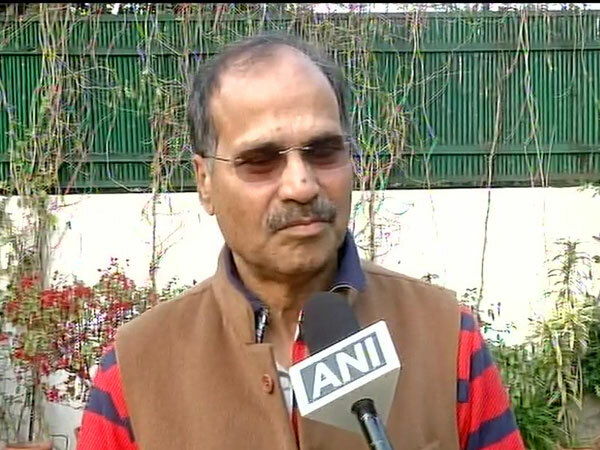 Congress MP Adhir Ranjan Chowdhury talking to ANI in New Delhi on Tuesday. The Supreme Court on Tuesday directed Rajeev Kumar to appear before the CBI in connection with the Saradha chit fund scam probe. The bench headed by Chief Justice Ranjan Gogoi, however, said that no coercive step should be taken against Kumar, who will now appear before the CBI in Shillong in Meghalaya. The Supreme Court, which posted further hearing in the case to February 20, also issued a contempt notice to West Bengal Chief Secretary, the DGP and the Kolkata Police Commissioner on a plea which said that a CBI team was detained when it went to question Kumar on Sunday. The Supreme Court’s directions came a day after the CBI approached the apex court to complain that Kumar, a senior IPS officer, was not cooperating in the chit fund scam probe, which being monitored by the top court. An attempt by the CBI to question Kumar at his residence in Kolkata on Sunday was foiled by the local police, which detained the team of the central investigative agency for some time. The CBI, in an affidavit filed in the Supreme Court, alleged that there were several incriminating materials or correspondence in the Saradha chit fund case that were collected during the investigation by the CBI against the senior police officials and politicians. The CBI had on Monday filed a contempt plea in the Supreme Court against the Chief Secretary of West Bengal, the Director General of Police and the Kolkata Police Commissioner for their alleged willful and deliberate violation of the apex court orders. The agency said the non-cooperation of Rajeev Kumar was brought to the notice of the West Bengal DGP. However, neither the DGP nor the Police Commissioner cooperated alleged the CBI. The CBI is investigating this case under a “hostile environment and non-cooperation from the state of West Bengal and its agencies/departments,” the petition said. Rajeev Kumar, a 1989-batch IPS officer, has been serving as Kolkata’s Police Commissioner since January 2016. He has allegedly not responded summons from the CBI in connection with their probe into the Rose Valley and Saradha ponzi scams.